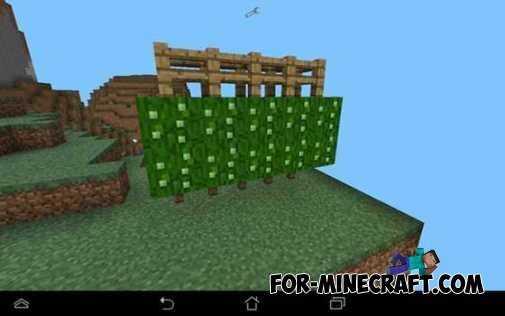 GrowthCraft PE mod adds many new features of agriculture in Minecraft PE. Its first objective is to use for wine grapes, hops for brewing beer. How to make a grape? To get the seeds of grapes, to be split vines. To get started growing grapes, you must first place a fence where you want to grow the grapes and then click on it the seeds of grapes. Grapes can be eaten raw or used for winemaking. Start by crafting fruit press (5 wooden planks and 4 iron ingots). Fill fruity grape press, by just clicking on it. After more than 8 power press, you can click on a glass bottle (glass 4) to fill it with wine. To turn new wine into old wine, you just need to fill their barrel fermentation (3 wooden planks and iron ingots 6). Both young and old wine to drink, but old wine will give you more health. How to make a hop? To get the seeds of hops to break the vines. Then put the fence blocks to each other to make the wall enclosure, at least four blocks high. Then use the seeds of hops by clicking them on the walls, but make sure that under them there is at least one block of air. After hops up, just click on the block. It is possible to use bone meal to make it more rapid growth.